In my neck of the woods (So. Florida, U.S.A.), it seems like Mother Nature is doing a ‘make-up’ job. You see, normally, the summer thunderstorms are a commonplace during the June month. However, this year was not the case. Based on the forecasters’ reports and from the look of the parched lawns, there’s a deficit in rainfall amounts for the year. So, on this ‘Hump Day’, as I watched the skies go grey and dark, I smiled. I knew that I was home-bound for the evening. And, what better day (well, night-off) than ‘Hump Day’. My stomach agreed and made a growl reminding me that it was in need of something hearty and delicious. As I hopped in my kitchen, I prayed that there was no interruptions with the electric power due to the thunderstorms.Time was of the essence. I didn’t have the time to grab a shower as I normally would. I was alone and I made myself at home and did a quick dismantle of all my garments. With rapid action, I tossed and placed my shoes and belongings out of my path. It was time for cooking action. With a thorough wash of my hands, I then went for my cutting board. I was on a mission. As I felt the cool effects of the air conditioner flickered down my back, I went in search of my supplies. I thought about my vegetables on how fragile they are during the summer months. 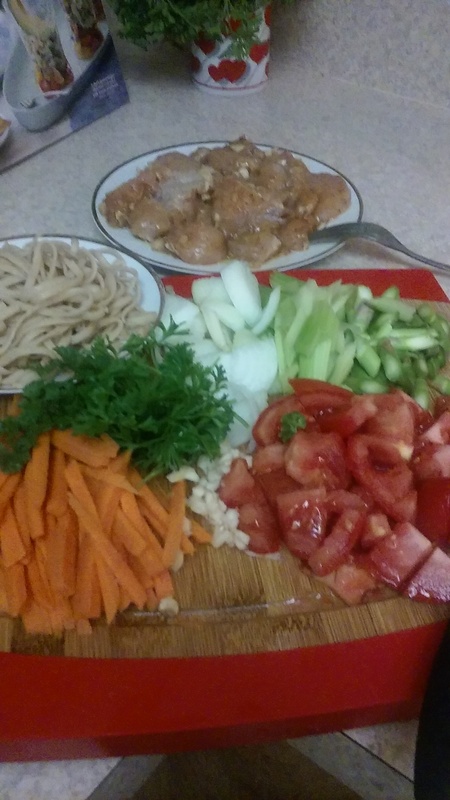 I was in no mood to let them further plummet, so I decided to do a quick stir-fry. On my cutting board, I did a quick chop of the veggies. I also grabbed a little left-over linguine pasta along with seasoned chicken breast pieces. I wanted to cut the chicken pieces thinner; however, I didn’t trust the heightening of the storm on the outskirts.As I glimpsed the clouds cascaded in the elements and thunder sounded, I crossed my fingers as I heated my grill pan. I also made a concerted effort to heat my skillet. 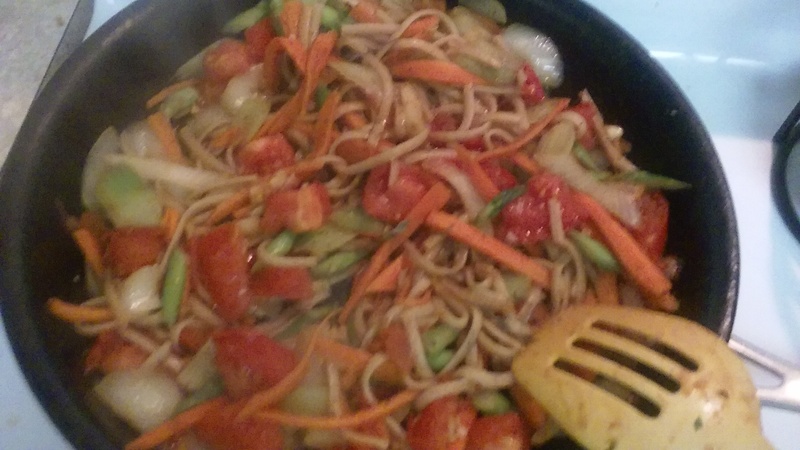 With the drizzle of a little olive oil in the skillet, I did a quick stir-fry of my veggies on medium to high heat. I made sure to keep the integrity of my veggies. I aimed for crispy finish. I also seasoned with salt, black pepper to taste along with a pinch of five-spice seasoning bearing in mind that a little goes a far way. At that point, I added left-over linguine pasta that was cooked al dente style at a previous meal. I was happy as I watched the tomatoes and veggies expelled their own juices. That provided a delicious sauce for the pasta. My grill pan was ready for action as well. 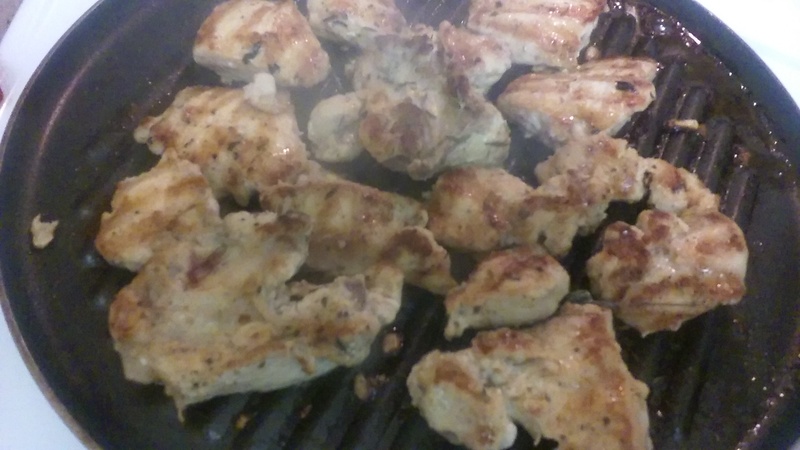 With a drizzle of olive oil on my chicken pieces, I placed each piece on grill. They were cooked thoroughly on each side and produced their signature grilled marks. I squeezed a little fresh lemon juice on and allowed them to sit for a few minutes so that the juices could be redistributed within. As I watched the torrential rains beat upon my back patio, I perched in my favorite stop on my sofa. I ate my way to true contentment and glee as I bit into each morsel of my stir-fry and grilled chicken. I smiled with true elation knowing that I had somehow weathered the storm without a flicker of the lights within. It was time. It was time for my ‘Hump Day’ cocktail. Guess what? I settled for a small screwdriver with fresh Florida oranges of course. Salud! I’m legit drooling right now! Everything looks soooo good! Oh, I need to send you a bib! :) Thank you for peeking.Your visit is appreciated.